Members of the Berry Alumni Association send regards and hopes for a speedy recovery to Martha Berry, who was unable to attend the association's annual banquet. 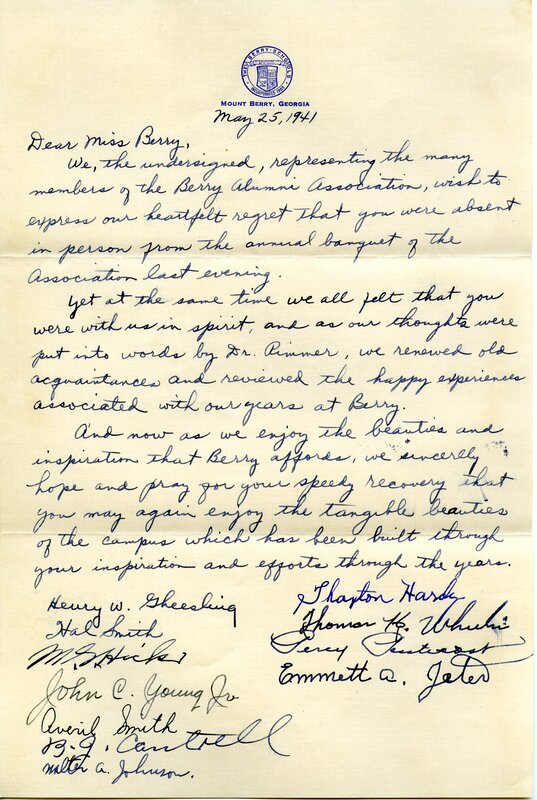 Multiple Authors, “Letter from Members of the Berry Alumni Association to Martha Berry.” Martha Berry Digital Archive. Eds. Schlitz, Stephanie A., Sherre Harrington, Samantha Smith, et al. Mount Berry: Berry College, 2011. accessed April 22, 2019, https://mbda.berry.edu/items/show/515.